According to series creator Bill Lawrence, the eighth installment is the last “official” season of his critically championed cult favorite Scrubs -- a daringly broad thirty minute medical dramedy. With this in mind, ABC's desperate attempt to charge up the paddles and shock Lawrence's unique formula back for one more viable chance at television life seemed destined for failure before it even started. And despite the fact that ABC was willing to risk millions to bring Lawrence's latest series Cougar Town to the air even with the horrifically bad name, unfortunately when it came to Scrubs, the network was unwilling to let him alter the title in the slightest to let fans know that this season would be the birth of a brand new spinoff. 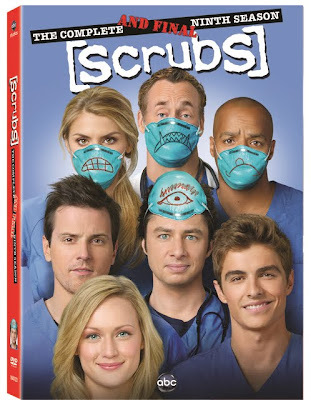 Yes, it looks like Scrubs and talks like Scrubs as series regulars Turk (Donald Faison), Dr. Cox (John C. McGinley), Elliot (Sarah Chalke) and J.D. 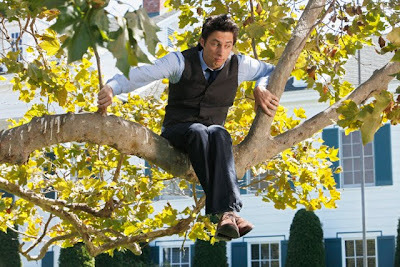 (Zach Braff) among others reappear for anywhere from one to all thirteen episodes. However, Lawrence was right to have sought out a name change since once we grow accustomed to the college campus set-up which turns our physicians into medical school professors, we realize that everything we loved about Scrubs is gone with the new set. Similar to the inevitable letdown one faces when a high school series goes on well past graduation and moves against the natural evolution of the way people change, the characters somehow wind up sharing dorm rooms, Scrubs' ninth season smothers the individuals that the actors' alter-egos have become by turning them into caricatures. It's no longer quite as novel to see J.D. and Turk run across a campus to celebrate their bromance when two seconds later they have to mold the minds of new students who seem like derivations of previous Scrubs characters. Fittingly since previous scene-stealer Dr. Cox always referred to J.D. as a woman anyway, Scrubs introduces us to our new female spinoff of J.D. (with a little of Elliot thrown into the mix) when actress Kerry Bishe takes the reigns as both narrator and star for her turn as the bright-eyed, horse obsessed Lucy. Although Dr. Cox is still around to whip them into shape, he unexpectedly bonds with Drew (Michael Mosley), an older brilliant but mysterious student who returns to medical school after dropping out years earlier, which sends J.D. 's daddy/mentor issues spiraling out of control. As a new variation of Turk and “The Todd,” we also meet the cocky, bravado filled son of one of the school's top contributors, Cole (James Franco's younger brother Dave) who alternately battles his feelings of entitlement with some glimpses of actual promise as the season continues. Easily the most obnoxious yet frequently hilarious character in a ho-hum year, Dave Franco helps keep the show from feeling as stale as Cox's now tired sounding speeches that just don't have the same impact when J.D. isn't on the receiving end. Unfortunately, while her character is vital as a supporting player, Lucy is a bit on the dull side regardless of how much they try to quirk her up as the Elliot and J.D. mix of sunny optimism and dedication. Moreover, the series' most fascinating “newbie” is decidedly Drew who may have been the right choice for a lead after all and one that would've been that much more unexpected if they would've cast a female to break Scrubs out of season nine's rut, thereby creating a woman other than his wife who can take on Perry Cox. Despite a forgettable introduction, Scrubs manages to show some promise during the third episode of the season but ultimately it just throws in the towel and the scalpel as it continues onward, hacking away at chances for originality in favor of something resembling safe bland TV comfort food. Thus, whereas Cougar Town would only get better as the same year continued on, Lawrence's legacy with Scrubs grew a little dimmer, making us yearn back for the days when J.D. truly was a newbie walking down the halls of Sacred Heart hoping to hell he wouldn't run into The Janitor (Neil Flynn) and Dr. Cox, of course.